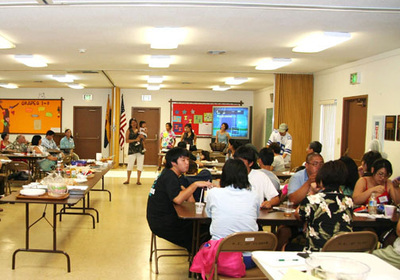 Successful 2nd Annual Florin Obon Workshop! Edging closer and closer, 1½ year old Heather Kurasaki peered intently at dance teacher Cheryl Miles as she deftly straightened the obi sash around the waist of teenage assistant Leesa Kakutani. An equally curious group of six preschoolers gravitated forward during the popular July 14th Obon Dance Workshop at the Buddhist Church of Florin. Defying blazing 102 degree heat that day, they joined a diverse crowd of 70 seeking understanding about Obon, folk dance, and the Nikkei community’s premiere festival. The Florin Dharma School and Florin JACL Youth & Family Programs welcomed the crowd to this 2nd annual event. Attendees including eight families with young children, college students, and faithful Obon lovers ranging to age 88, absorbed the origins of Obon from Reverend Ryo Imamura. He engaged both young and old telling the story of Buddhist monk Moggallana’s despair over his deceased mother’s suffering in hell. Moggallana dedicated himself to selfless deeds to earn his mother’s release, then dancing for joy and inspiring the Obon Festival celebrated today. 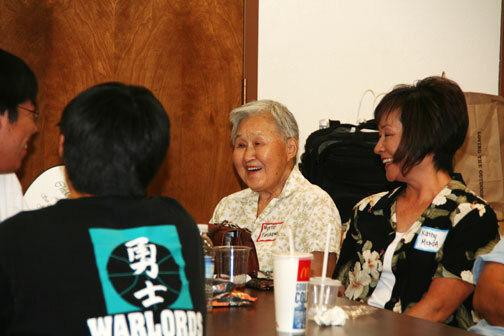 Cheryl Miles, assisted by Leesa Kakutani and Leslie Okamoto, captured everyone’s attention with her helpful “tricks of the trade” on dressing for Obon. A Natori Hanayagi Classical School of Dance teacher, she demonstrated the challenging Obi sash tying. 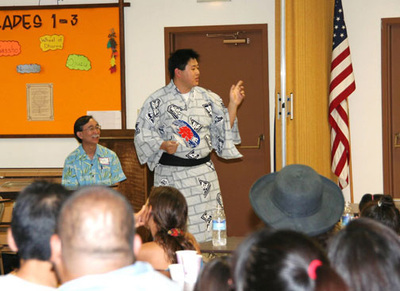 Now in her 22nd year as a Florin Obon dance teacher, along with sister Michelle Takeda, Cheryl urged young people to get involved in Obon. She also thanked elder dance teachers like Myrtle Furukawa, attending the workshop, for encouraging her to become an instructor. Other speakers included Walter Menda, Florin Dharma School co-Superintendent, sharing their many religious, social, and cultural activities. 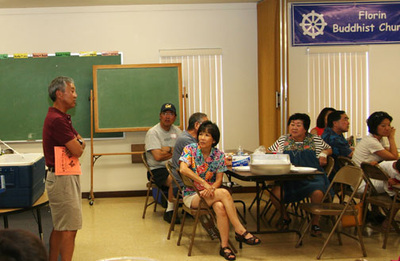 Karen Kurasaki, Florin JACL Youth co-Advisor, recounted the Chapter’s family & youth events such as the “old-school” mochitsuki sweet rice pounding workshop. Tadao Koyama, UC Santa Cruz student and Florin JACL youth activist explained the "social" benefits of Obon. It’s a great place to hang out with friends – and pick up girls. Since many people had rushed to the workshop without dinner, the committee hosted a tasty BBQ hot dog meal, complete with homemade chili, chips, senbei rice crackers, watermelon, and scrumptious desserts. Appreciation goes to head chef Fumie Shimada, Terry Nishizaki, and to all those who brought food. 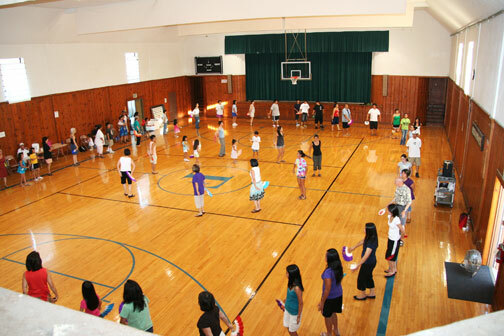 Going straight from the motivating workshop, the 70 participants joined the evening’s Obon dance practice - the day’s 102 degree heat be darned. With a huge turnout of over 125 dancers, it appeared to be a record crowd. After the workshop and practice, many people felt welcomed and encouraged, joining the 250 dancers and hundreds of spectators at the Florin Obon Festival on July 18th. 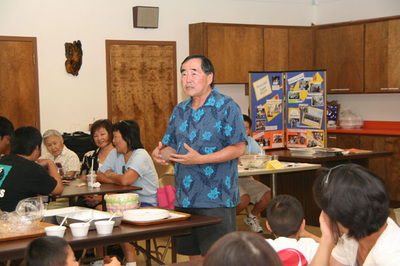 Appreciation also goes to Judy Yuki, Florin Dharma School co-Superintendent, Ron Okimura, Judie Miyao, Jennifer & Steve Kubo. Also, for the dedicated participation of college student John Kanemoto, Twila Tomita, Sam Shimada, and Marielle Tsukamoto of the Florin JACL. Thanks go to the Nichibei Times for their excellent Obon & Bazaar Guide special edition, a valuable community resouuce shared with the audience.